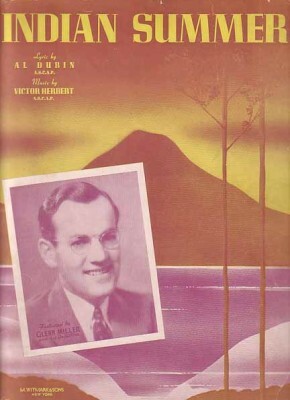 Although written in 1919, “Indian Summer” did not become a hit until bands picked it up in the early 1940s (this may have coincided with the addition of the lyrics by Al Dubin in 1939). Frank Sinatra recorded with Tommy Dorsey in 1940. Other recordings include those by Gene Krupa, Glenn Miller, Sidney Bechet and Sarah Vaughan. “Indian Summer” was recorded on March 16, 1962 and was released in 2006 on the CD re-release of I Wanna Be Around. It was arranged by Marty Manning. “Indian Summer” was recorded in June 1992 and was released that year on Perfectly Frank. It was arranged by Ralph Sharon. “Indian Summer” was recorded and televised live on April 12, 1994 on MTV. This song was recorded as part of a medley with Autumn Leaves. The MTV Unplugged album was released in June of that year. The songs from the televised concert were arranged by Tony Bennett and the Ralph Sharon Trio.